With the majority of employees now wanting to work for a socially responsible company how do you leverage your CSR efforts to engage and motivate your staff? The nature of work as we know it is undergoing fantastic change. People are getting used to the fact that they will have to work for longer and in this ‘generation bending’  era we are witnessing amazing diversification in the workplace with Millennials working alongside Baby Boomers and Generation Z now entering the workforce. So it stands to reason that if we are going to be working longer then we will start to apply a new set of criteria when choosing who to work for. Over the last ten years or so we have seen a big shift away from ‘money is the only motivation’ to ‘I want a balance between a decent wage and my welfare at work’. PwC research now shows that 65% of employees want to work for a socially responsible company. As non-statutory welfare schemes become more mainstream (flexi time, health insurance, assistance programs, not forgetting the recent pensions reform!) employers are struggling to ‘stand out’. With 79% of employees considering corporate social responsibility (CSR) commitments when deciding where to work employers are increasingly leveraging their CSR programs to engage the workforce. Millennials and Generation Z typically have the strongest views on social and environmental responsibility and the tools to research and vent their opinions via social media. The enthusiasm of youth is highly infectious (keep shining bright young things!) and this generation is having a profound impact on the baby boomers and others alongside whom they work. If you’re reading this at your desk now take a minute to look around. I’d bet you can see each generation well represented in your office, working shoulder to shoulder and influencing those around them with their social and environmental views: bicycle helmets on desks, diligent recycling habits, re-useable water bottles, the list goes on! Looking to the future, HR strategy is developing to attract the top talent and is capturing younger generations’ aspirations and views on employment, including building new talent strategies matching their organisations social conscience with the beliefs of their employees. That’s because engaged employees are happy employees! Improved motivation increases attendance, reduces sick days and increases tenure of staff. This is clearly to the benefit of all but especially to HR. An effective CSR strategy can reduce the company’s staff turnover rate by up to 50% and increase productivity by up to 13%. I’ve seen employee targeted CSR programmes increase average tenure by 30% in the retail sector, imagine what a 10% increase would mean to your business? After all, nothing is sustainable unless it brings business value too. You may be lucky enough to work for a pioneering brand who has decided that CSR deserves a place at board level and is a key strategy to run a more sustainable business, differentiate your brand and survive for the long term. Brands such as Marks & Spencer’s, Ecotricity, Google and TOMS are some examples of brands widely recognised as leading the way on this front and so communicating this to employees is an easier task. Having said that, it is easy for an employee to feel disengaged if the business aspirations don’t match their own. You could argue that they need to find a better match (!) but often it’s a lack of tangible results which drives down engagement. Employees will get a sense of pride when their business backs a good cause but that sense of pride and motivation can really swell if they actually chose the cause themselves, especially a cause which matters to them locally, and one which they can share the outcomes amongst their social following. Alternatively you may work for a brand which is on the journey to become a pioneer in this space and is not quite ready to make this strategy public. You may need to look at more tactical ways of leveraging your CSR efforts to engage employees and that’s where staff giving programmes can be highly effective. We meet with many fantastic businesses who run great giving programmes and the two most popular types are match funding and volunteer programs. 72% of European companies surveyed by CECP offered an employee matching program in 2014 (this can be as generous as £6,000 per employee!). Most employees go for the classic raising money for an established larger charity but fewer will raise cash to do something at a more grass roots level and be directly involved in the outcomes. This could be raising cash to buy materials to fix the local sports pavilion or to take a local youth group on a day trip. Very few initiatives will involve a larger group of employees getting involved and the kudos, quite rightly, only goes to the individual who did the ‘leg work’. It’s great their employer matched the cash but do they really care? Companies are giving away millions of pounds to great causes but are not being associated with the positive outcomes. It’s this lack of visibility that often makes staff question how socially responsible their employers are. There is also a question of sustainability in these programmes – your staff can only go to their friends and family so many times to ask for sponsorship and once this generous resource is exhausted there isn’t anywhere else to go. Perhaps a better way to encourage team building and really get momentum behind some good causes is to run a volunteer week. 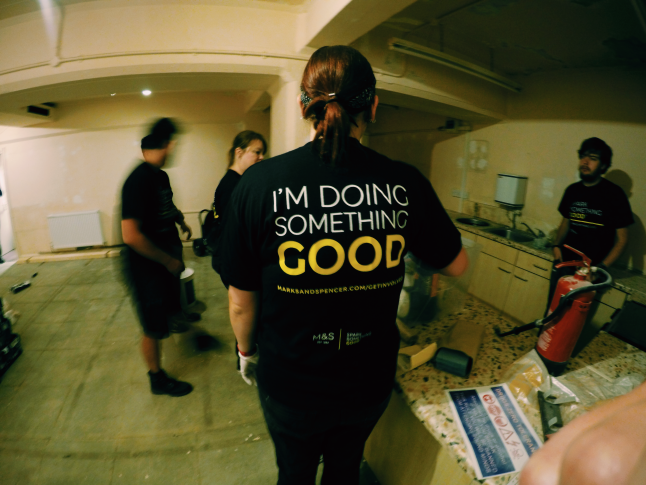 This can have a profoundly positive impact on staff morale - 83% of staff at Aviva say that volunteering improved their motivation. The best of these programmes provides an intranet site with a pre-selected list of projects for staff to choose to be involved with. Giving time, and more importantly, matching specialist skills to a recognised need in the community around your stores or offices is often more appreciated by local projects as the value donated is seen as so much higher. Providing an after school club some help from your accountants with managing their books will stick in the mind longer than a donation of cash. As the saying goes: better to teach a man to fish than to give him fish for the day. The issue is that these programs are often only run once a year and are driven from HQ presenting pre-defined options for volunteering. This leaves staff feeling less engaged in a project they do not resonate with. This is perhaps why, according to CECP, only 30% of employees volunteering is the average. Also there is a big anti-climax after the week of activity – what happens next? Will I get to see the project next year? What impact did I have? Do I need to wait a whole year to get involved again!? 50 years ago the workplace was very different. Work was more of a vocation for most and you stayed in a role for your entire career. To a large extent what you did shaped the person you were, be it a farmer, builder, factory worker, seamstress, baker, etc. Careers and skills were handed down through generations and defined entire families. Perhaps what we are witnessing is a shift back to these values. Your job title will not define you but your choice of employer will as it increasingly aligns with your personal views on social and environmental responsibility. As an employer your CSR strategy is becoming more and more important to your workforce. By providing staff with easy access to, and greater visibility of, your social and environmental programs you can create a culture of engaged, happy employees for whom work is more than just a pay check. Businesses that win will be those who can clearly articulate their CSR vision to a highly diversified workforce and offer everyone the opportunity to get involved in something they care about, making sure they see real outcomes and can continue their great work year in year out.